All transactions are safe and secure with a reliable history in online purchasing behind each of our associates. Buy The Walken Dead t-shirt to own Walking Dead clothing and merchandise. 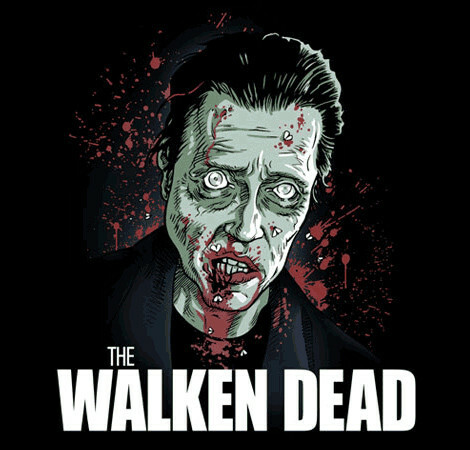 This creative and hilarious parody design is based on the popular POYKPAC comedy skit called The Walken Dead. In the video, a virus plagues our civilization, destroying all parts of the brain except for the part that controls basic motor functions and the part that stores Christopher Walken quotes. As a result, the zombies walk the earth in search of brains and cowbell, while at the same time spouting out famous Christopher Walken quotes. In addition to The Walken Dead tee above, browse the Walking Dead Clothing Gallery for more apparel like men's and women's clothes, kids shirts or hoodies.